This page collates a number of different outreach resources that can be found on the ESA websites. Background information (pdf file) about the mission and the second data release. Includes chapters about how Gaia maps the sky, the role of DPAC, the demands of operating the spacecraft, and the history of astrometry. Background information (pdf file) about the mission. Includes chapters about how Gaia maps the sky, the role of DPAC, the demands of operating the spacecraft, and the history of astrometry. A glossy brochure summarising the mission, the spacecraft and the key science goals. Download in pdf format. The mission poster can be downloaded in JPG format. 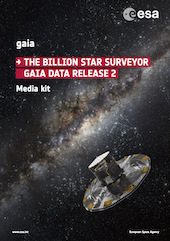 A double-sided A4 summary sheet, or flyer, of the Gaia mission can be downloaded in pdf format. It is available in Dutch, English, French, German, Italian, and Spanish. The Gaia Project Scientist's Support Team have produced posters covering different aspects of the mission: Gaia Mission Overview, The Gaia Spacecraft and Instruments, From Observation to Catalogue, Data Processing and Analysis Consortium, and Gaia's Scientific Rewards. These are available in pdf format. Episode 6: Charting the Galaxy - from Hipparcos to Gaia can be viewed online or downloaded in different formats. The vodcast is available in English, French, German, Italian and Spanish.